The Testo 882 scores very high in image performance. I am impressed by the 320×240 image quailty and it is evident that the sensitivity is every bit as good as the stated <60mk. 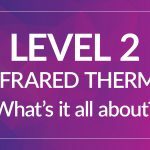 Despite measurement capabilities up to 350°C, the first range is -20 to 100°C, which takes full advantage of this sensitivity which is preferred for the building performance diagnostic market. The secondary measurement range allows a full 0 to 350°C range to be accessed in one go, which is ideal for those higher temperature applications. This version of the unit is a 9Hz model, which is acceptable for stationary targets such as switchboards etc… however if you were moving quickly (ie walking through a building or along a conveyor line), in a moving vehicle, or wanting to image a moving or rotating target you would want the 33Hz version. EDIT: Please note that 33Hz is standard in the Australian market. This is not the case for many export markets. What’s with that wide angle lens? I was sceptical at first with using a 32° wide angle lens for mechanical and electrical applications. Sure this is ideal for building diagnostics where we want a larger field of view and temperature measurement is not critical. It’s also very handy for when working in close proximity to large motors and machinery. However, an IFOV (geometric resolution) of 1.7 rad is larger that what I would usually use for an electrical inspection. To my surprise, Testo, unlike many manufacturers, also includes the MFOV (measurement field of view) or the Spot Size of the camera in their specifications. This reveals that the camera is capable of measuring a 5mm target size at a distance of 1 meter. That equates to a very respectable DTS (distance to spot size) of 200:1. This is an excellent measurement capability, that is similar to many cameras that have much smaller IFOV’s. 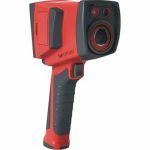 In short, it’s measurement capacity is not diminished by its wide angle lens, giving you the best of both worlds; wide angle view for maximum scene capture and accurate temperature measurement. This comparison is relative to building diagnostic imaging. Here is a good comparison of geometric or spatial resolution as we look at small components on PCB boards (in this case a PC motherboard). What is the visual image like? The visual image capture is handled by a 640×480 digital camera. While not the highest resolution, it is crisp, clear and undistorted and handles low light levels extremely well. When the going get’s really dark the 882 has 2 inbuilt super bright LED’s that provide ample illumination. The screen is nice. It’s a respectable 3.5 inch LCD that displays 320×240 screen resolution. The angle is really good and allows the screen to be easily read under most conditions. The brightness is great and really illuminates even the smallest objects clearly and precisely. The camera does have brightness control, for those who might want to save some battery power. Speaking of battery, the Testo 882 utilise a lithium ion battery that slides up through the base grip of the camera handle. It provides a very commendable 4 hours of operation. What I found particularly well thought out was the “key locks” machined into the side of the battery to prevent it from slipping all the way out on release. This stops it from dropping to the floor (or on your foot) when you hit the battery release button. You need to give it a firm pull to release it from the camera. All initial indications show very little to go wrong with this locking mechanism… only time will tell. It is a little disappointing that the standard model only comes with one battery and this must be charged within the camera with the provided mains adapter. At this price point, it is hard to complain, and additional batteries and dual bay chargers can be purchased for a modest fee. The fine engineering of the battery and bay design doesn’t end there. The overall build quality of this unit is excellent. Plastic mouldings are well finished (no sharp edges) and the casing fits together well without gaps or overlaps. Soft touches are added all over the unit with rubber panels and inserts on all the main wear and contact points. The buttons feel firm and have a positive sound and feel when pressed. They are made of firm rubber giving a quality feel. There is nothing worse than cheap hard plastic buttons that click loudly making you feel like you are playing with a kids toy. The Testo 882 quite simply has excellent ergonomics. The pistol grip is highly contoured to fit your hand with a confident and natural grip feel. The buttons are within easy reach of my thumb, but it may challenge those with smaller hands. The unit is well balanced and weighted, unlike similar “pistol” style cameras that tend to be top heavy and require the user to really hold them in position. The manual focusing lens turns effortlessly to provide crisp clean images, the rubberized lens ring providing ample feel and feedback to the fingertips. Manually focusing the camera does require 2 hands, so for those who require single handed operation, a simple flick of a switch and the camera can now be focused by a motorised switch directly at your index finger. Very nicely done! Can you get any bits for it? 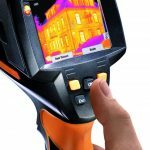 The accessories and options are a little limited at the time of this review, however, due to its infancy more may become available later in line with the rest of the Testo Range. Unlike the Testo 875, and Testo 881 models, the list of accessories does not include a telephoto lens, which will disappoint those wanting to use it for distance applications. The sun shield accessory is pretty basic in terms of reducing sun glare and offers more physical protection from bumps and knocks than it does the sun. I would recommend it on this point alone. However, if you want real sun protection you would need to consider the “soft case” which provides excellent physical protection, a connection point for a lanyard and a broader visor for sun protection. Testo provide their full Professional Reporting software at no extra charge. At the time of this writing, I tested Version 2.7 of the unoriginally titled ” IRSoft Software”. While the name doesn’t stand out, the software does. This software is stable, bug-free and put together very well. It would classify it as ideal for entry-level users wanting to create, precise reports at the touch of a button. What makes it entry level is that the recipe is simple, straight forward and hard to make a mistake. If trying to create something more detailed and elaborate it may disappoint seasoned professionals. I am a firm believer that when it comes to software you can’t be everything to everyone. The end result is a very professional looking report with minimal fuss… which is what we all want, right? My first impression is that it is neat and orderly, allowing one to work through their images with the minimal distraction of confusion. 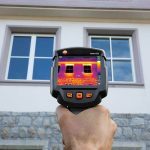 All the essential tools are located in the same “box” as the visual or thermal, so you don’t need to look far to find what you need. One of the primary adjustment functions, the level and span, or in this case titled “temperature scale” is a large and impossible to miss function on the right side of the screen. 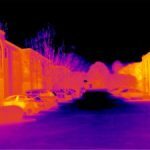 It utilises arrow sliders that get the job done with ease and give a good graphical representation of the image’s scale relative to the available temperatures measured. It deals with isotherms and “colour saturation” functions (seen as “limit values”) in a very intuitive manner. Big thumbs up for this interface. It does take a while to work out what all the little icons do, but at least when you roll over the icon with the mouse pointer you get ample indication of its function. One nicety is that you can tweak the image brightness on the visual image, something that few manufacturers pay attention to. Can you Zoom in on that buddy? The answer to that is, “no sorry I can’t”. 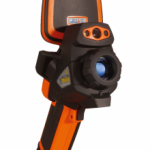 Something I was unable to find was a zoom control or function for the thermal image. Often, especially when imaging small targets like SMC’s on PCB’s I would like to zoom in to inspect the individual component. I am not sure if I was missing something but could not find this function in Version 2.7. An easy to use and straight forward report wizard allows you to choose from multiple templates and steps you through the reporting process. The software provides you with 5 industry standard templates pre-prepared. This is quite a common place in modern software, I would accept nothing less. Report templates can be customised and modified using a template editor and this is where things get a little difficult for those who want high levels of customisation and aren’t IT wizards themselves. While you can add a personal touch with relative ease, creating more complex presentations is not as intuitive or easy as some word based templates utilised by other software. It requires some work, but most people will end up with a satisfactory result. Also, another minor criticism is that your final report is in a proprietary format (*.tir), however, the software does enable you to save/export as a PDF. There is no word option available. Overall, it is what I would describe as robust and comprehensive software for general predictive maintenance or building diagnostic purposes.